Once you’ve published your app or extension, you may be wondering how users will find and install your app. 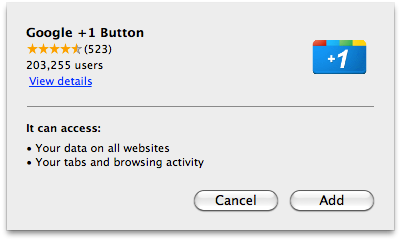 For users who browse the Chrome Web Store and find your item, its a very easy one-click process to install it. However, if a user is already on your site, it can be cumbersome for them to complete the installation – they would need to navigate away from your site to the store, complete the install process, and then return. As of Google Chrome 15, you can initiate app and extensions installations “inline” from your site. These apps and extensions are still hosted in the Chrome Web Store, but users no longer have to leave your site to install them. When users install the app, they will see an installation confirmation dialog similar to the one pictured on right. Just like the dialog displayed when installing directly from the Chrome Web Store, it lists all of the permissions that your app or extension is requesting. Additionally, this dialog includes the average Chrome Web Store rating and the number of users, giving users extra confidence about what they are about to install.